I was not a streamer, now I am. I wasn’t using a streaming service until my daughter and her friends pestered me enough to try one. They wanted to share playlists with me and easily share new music they found and old music I liked. So I signed up for a 3 month free trial of Spotify Premium. Unexpectedly, I quickly grew to love the features that a streaming service allows. Yeah, millions of songs but also features like ease of search, sharing, following to see what your friends are listening to, and the service’s ability to suggest songs/artists you might like and continue your stream by playing what it thinks fits your taste. Spotify did a pretty good job “getting” me and suggesting/playing songs and artists that fit well with my playlists and listening activity. However, Spotify could not access my extensive iTunes library when not on the same home network as my Mac Pro where the media library was located. I wanted to be able to easily stream from either the service’s library or my own library. I could only do this at home with Spotify. So when my 3 month free trial of Spotify Premium was over I decided to try Apple Music – they offered a similar 3 month free trial. I switched from Spotify to Apple Music. The first thing I did was get an app to help migrate my Spotify playlists to Apple Music. I chose SongShift Pro ($4) and it works remarkably well. I was able to easily and quickly migrate all of my Spotify playlists to Apple Music with only a few misses or SongShift mistakes – not all songs are in both services and SongShift guessed wrong on a few but got almost everything right. Thanks SongShift! I noticed two things about Apple Music right away – I was able to access my personal iTunes library from anywhere using any device (yea!) but I really missed the Spotify user interface (boo!). Since my iTunes library is reflected in my iCloud account I can access it from anywhere, something Spotify is not able to do. This is an important feature for me. However, Spotify’s user interface is so much cleaner and feature full. Which service is better suited for my needs? After 3 months free on Spotify and 3 months free on Apple Music, here are my pros and cons for each service. 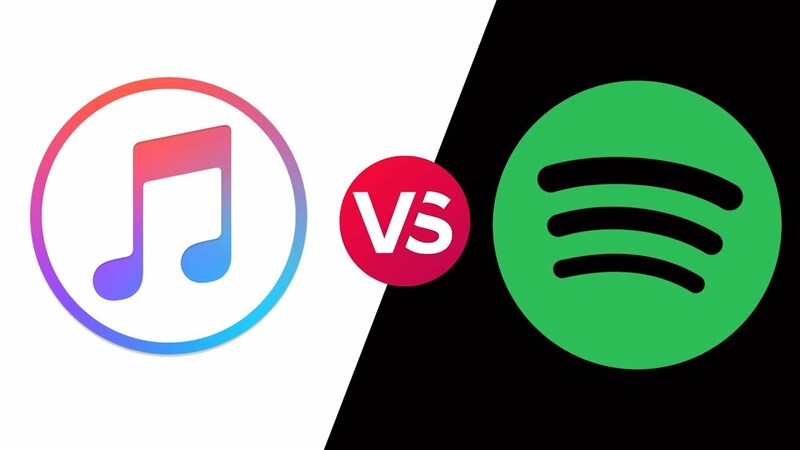 Spotify and Apple Music charge the same for their services. Student accounts are $5/month, Individual $10/month, and Family (6 people) $15/month. Spotify is the clear winner on ease of use, user interface, and usability. Apple Music has 50 million songs, Spotify has over 30 million songs. Each provide playlists curated by the service designed to provide views into those large libraries. I found that Apple Music’s curated playlists are better suited for my tastes. In addition, Apple Music has an excellent set of music videos and music video playlists. Apple Music wins the content battle with Spotify. Both services provide the ability to share, however I found Spotify’s sharing facilities easier to use and more powerful. One feature I like in Spotify’s user interface is the bar in the upper right corner that displays in real time the songs the people you follow are listening to. Maybe that’s creepy but I like it. Also, in my case, more of my friends and family use Spotify so in order to share with them I need to either share from Spotify or migrate a playlist from Apple Music to Spotify to share. Spotify wins the sharing comparison. The ability to access my personal library from anywhere on any device is important to me. Apple Music allowed me to access both it’s online library and my private personal library. Spotify could only do this when on the same network. Apple Music wins the portability challenge. In my 6 months of use and testing, Spotify came out the clear winner in usability and sharing while Apple Music is clearly the winner in content and portability. There are UI features in Spotify that are superior to Apple Music and generally, music discovery in Spotify is superior (although Apple Music has better curated playlists). However, since I am a heavy iTunes library user, having created an extensive library of over 35 thousand songs and dozens of playlists. This makes Apple Music a better fit for my streaming service requirements and needs. However, I still wanted to use Spotify’s discovery, playlist creation, and sharing features. So what I ended up doing was using the pro version of Apple Music and the free version of Spotify. With SongShift I am able to migrate playlists between the two. I can explore, discover, create, and share on both services. Also, at the end of my 3 month free trial with Apple Music I was able to take advantage of a promotion through Verizon, my mobile phone carrier, for an additional 6 months free Apple Music pro. Tada! That will make 1 year free pro subscriptions – when that’s up in February 2020 hopefully there will be another free trial option to explore! ← Look what’s happening on Twitter!